There are forty eight techniques in TCC. These include "hidden" styles, such as; Break Arm style, Vanguard Arms, White Snake puts out its Tongue, Double Leg throw, Single Leg throw. Plus the styles that are not inherent in the hand form i.e. ; Tiger Yawning, Gyrating Hands, Free Flower Picking, Five Element Arms and Running Thunder Fist. When you then consider the many possible variations of these styles, this then gives an incredible variety of techniques. To practice them all, is to eventually have only one technique, that being the principle. To blend with the principle is to be able to utilise it in any situation. There may be a time when you can only use part of a technique, but it may be enough. For example; It may not always be possible to counter immediately, and sometimes it is not always advisable to try and counter everything, you can become too predictable, but you can still Parry a blow, or use the Elbow/forearm to deflect a kick. Or, use the techniques in combination. Although the techniques are all there, there is no guarantee that the opportunity to use them will arise. This is where it is important to see the principle first, and the techniques as the tools to be used in any number of ways. It is important and maybe a little obvious to say it, but, to counter anyone, firstly they have to be in the position to be countered. They have to be off balance before they can be thrown, or in a position so that you can strike. Not so easy when they do not want to be thrown or struck. Look at any contest and you will see how difficult it is to apply "clean" technique. Unless one is far superior to the other it is extremely difficult. All of the forty eight styles are very practical, obviously not as they are in the hand form, never the less, they are effective techniques. To have these techniques is to have answers to the many questions an opponent will ask. It is also to train in sensing an opportunity on an intuitive level. The main thing is to be realistic. What will work and what will not? This is why basic technique is so important. It is having sound basic techniques that creates the ground for further and less specific techniques, more along the lines of blending all the styles into one. I'm trying to see, and explain the way all of the techniques become one. It comes through the practice and constant repetition of the techniques to reach the place where there is no need to "discuss" what works and what doesn't, you know what is effective and what isn't. If you are trapped in a corner, what are you going to do? Adapt, is the only thing to do. Cover up, punch when you can, kick when you can, scratch, gouge, whatever it takes. The one thing you won't do is the hand form. Although the subject here is the forty eight styles of application, it all comes back to the hand form. The hand form teaches shape, co-ordination, timing, spacial awareness, physical and mental focusÂ etc, all of which are crucial in applications. Maintaining ones shape, no matter the position you find yourself. Even if it is just for an instant, we are all aware when we "lose it". Shape in this context, can refer to the mind as well as the body. Although the form and applications are linked, they are not the same in application. To take the form too literally is a dangerous thing to do. Whatever is happening, it is the TC principle that matters, the techniques are the application of that principle and they will take many forms. That is why they should be practiced to the point, that the principle is internalized and all the techniques become one. It is always better if the opponent has no idea of what you are capable of. This creates uncertainty in the mind. In TC terms " I know you, but you don't know me". In this sense all techniques are "hidden", so that an opponent has cannot know with confidence, what to do. This term can also mean that outwardly there is stillness, while internally there is focus and awareness. It is important that an opponent be met with this"stillness". In conclusion, the principle and all the techniques that are there, are the reservoir from which to draw upon. 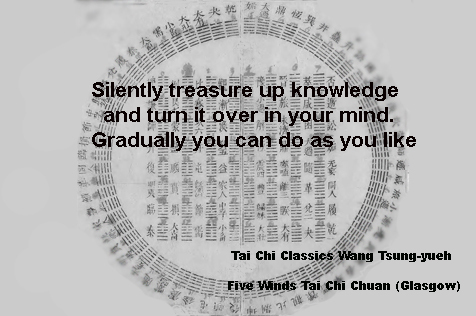 The ability to use the techniques to defend oneself using TCC, can only come through absorbing and understanding the TC principle. Although forty eight techniques are mentioned, the actual number is endless. The Spear Form, with only fifteen postures is the shortest of theTai Chi chi weapons forms as taught by Master Cheng Tin Hung. It is an essential aspect of Tai Chi Chuan training.It is said that practicing the Spear encourages wisdom. (Still waiting on that one). Like all weapons, the basis is in the hand form, meaning, that if the hand form is correct, then there is a good foundation for everything else. With the Spear and its potentially powerful techniques, it is perhaps easy to become focused upon the feeling of the form being ‘strong’ and rely upon strength. This is to miss the subtleties within the form. The Spear is the same as any other aspect of TCC, in that it is based upon the Tai Chi principle, and should adhere to this. Adherence, Connection, Entwining, Stabbing, Lifting and Hitting, Drag and Dot, Diverting upwards or downwards with a springing motion, Using Spirals to divert an attack and counter. Holding the Spear: The hand holding the Spear should be down in the ready stance position and only slightly forward, which is to say, the arm is at its natural length. (Fig1) When the Spear is brought up into the rear hand, it comes up from the ground at exactly the right width and settles into the hand easily. This relatively simple position is balanced, whereas, if the Spear is held too far up its length at the start, it is not balanced, the grip being too wide, effectively shortening the weapon. This creates an area of six to eight inches between the hands, that is “dead.” Equally, if the rear hand holds the Spear up from the end, this creates another ‘dead’ area. The rear hand has to be flush with the end of the Spear. In this on guard position, the left hand is ‘closed’. (Fig 2) The techniques, whether defensive or offensive, are greatly affected, depending on how the Spear is held. When thrusting, the final positions of the hands are: the lead or pointing hand will be again, the natural length, with no sense of being “wide’ or “stretched.” The right hand will be at the solar plexus. The correct body angle, adding distance to the thrust. If, on the other hand, the grip is too wide, the rear hand will be at the hip, the body too square on to the thrust, consequently shortening and losing the full effectiveness of the weapon. This also has the effect of making the form ”stiff” as it has stopped short of ‘going with’ the weapon. The left hand when thrusting is ‘open’ meaning, the forefinger points in the direction of the thrust, giving added focus. (Fig 3) The heels, when thrusting should be in line. This creates a continuous line from the tip of the Spear through the body to the rear foot. The left hand, apart from one posture, Cockerel Nodding its Head, should not wander from its original position. Even in the posture mentioned, where the Spear is effectively ‘shortened,’ by drawing it back through the left hand, allowing for a faster turn, the left hand returns during the execution of the technique, to its original position. with the weapons. Whatever the weapon, this too has to be part of the one unit. Whatever happens in the body, is reflected in the weapon. In terms of Yin and Yang, the Spear is Yang. However, there is softness within the form and any power generated, has to come from the total coordination of the body. Doing the form softly, an awareness of the moments of focus, such as when thrusting, parrying or the more powerful downward movement, is highlighted. It also instills a sense of timing. The form can be done large or small, slowly or quickly, each one bringing a different perception to the form. One has to be careful however, when practicing with the shorter lighter Spear. It is easy to develop bad habits as, there are things you can do with the shorter Spear, that the longer version will not allow. For example: The longer Spear won’t allow the focus of the weapon to stray from the direction of the opponent. To parry, taking the Spear too far back or too far to the side, leaves a gaping hole, and would be too slow to recover, which leads you vulnerable to further attacks. When parrying another weapon, it isn’t enough just to knock it out of the way. You use the same principle s in all Tai Chi Chuan applications, by going to meet the attack. 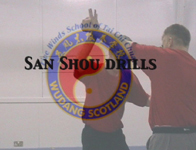 Using the anti-clockwise spiral, created by turning waist coordinated with the turning of the wrist, you can neutralise the attack, and by spiraling back in a clockwise direction add power to the counter thrust. When disarming your opponent by knocking the Spear out of his hand, turn the hand over until the power of the downward force is through the index knuckle of the left hand. (Fig 4) By using this turn more power is then generated in the downwards movement. Using these spirals can also allow you to ‘drag’ your opponent off balance. When practicing, the vertical (woof), horizontal (weft) and the diagonal must be taken into account. This is so that an attack will be caught in what should feel like a net. This net should seem like a ‘dome,’ one that surrounds you, so that no matter the direction of an attack it will be caught up and entangled within this net.